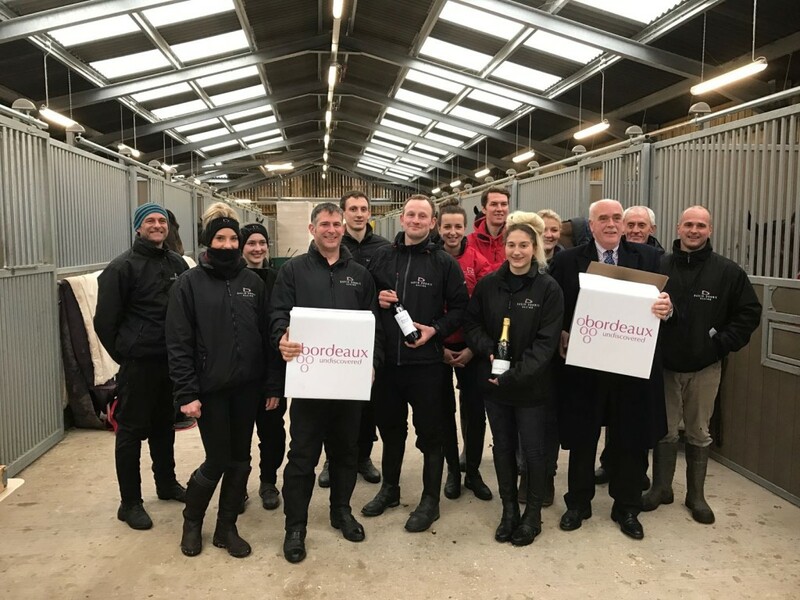 Our team were delighted to be awarded two cases of wine this morning by Nick Stephens of Bordeaux Undiscovered Wine Shop based in Eldersfield, Glos as part of a new scheme that recognises the staff behind the leading trainer at the end of each year at Stratford Racecourse. Bordeaux Undiscovered supply Stratford Racecourse with wine and they both got their heads together deciding to create an award to celebrate the unsung heroes of horseracing – the stable staff! Nick Stephens of Bordeaux Undiscovered said ” It’s always the owners and the trainer that get the recognition when the yard has a winner and so we wanted to highlight the efforts of the team behind the scenes by creating this award”. The highlight of our winners at Stratford throughout 2016 has to be Roman Flight when he landed the totequadpot Four Places In Four Races Handicap Chase by an impressive 16 lengths back in October and we very much look forward to many more runners and hopefully winners back at Stratford during 2017. On behalf of David and the team, we would like to take this opportunity to thank both Stratford Racecourse and Nick Stephens of Bordeaux Undiscovered Wine Shop for their recognition and generous prize as this really is a brilliant idea and a great incentive for all of those stable staff that work so very hard for their sport.